ABS-CBN News, GMA News, Rappler and Inquirer, all of which are media organizations based in the Philippines, have been tagged online as "presstitutes." The 'Mocha Uson Blog' Facebook page, created and managed by controversial singer and dance group leader Mocha Uson, a staunched supporter of President Rodrigo Duterte, posted a video of her interviewng veteran broadcast journalist Teddy Locsin Jr.
Locsin, who works for cable channel ANC and also a former politician and now a very active social media influencer, gave his own definition of the word, saying "presstitutes" don't have credibility. Truly revolting - Nine year-old raped and murdered and we haven't heard condemning this brutal act from human rightists, bishops and "presstitutes" who are derailing the government's war against drugs and crime. Among others, they are more concerned with the human rights of criminals and worried about our country's so-called "image" abroad. They clearly exhibit elitist mindsets in trying to keep up with the Joneses to be good in appearances but rotten to the core. Ngek! Our righteous battles against drugs and crime are fierce and relentless because we face the Devil himself. We cannot be soft or let our guards down lest we ourselves will be devoured and be defeated! Either an individual reporter or news broadcaster, or a media news group, who reports to be unbiased, but is in fact tailoring their news to suite someone's goal (usually corporations or big business political affiliates). 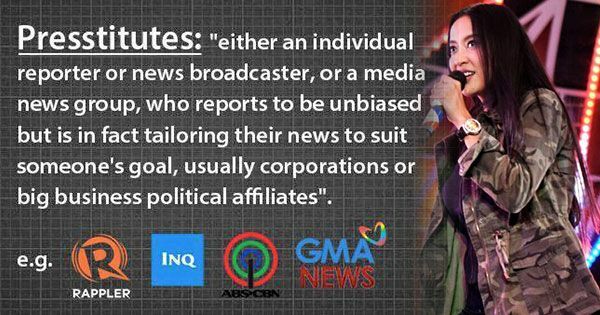 In a response to one of the comments on her post, Mocha posted a meme that states that same definition of "presstitutes," with the logos of ABS-CBN News, GMA News, Rappler and Inquirer shown below it. These media organizations have been accused by netizens of being biased against the Duterte administration. Mocha's post already got over 166,000 views on Facebook as of 1 p.m. today.